Podcast — James Arthur M.
We took a knee in support of Janet Appreciation Day (AKA Super Bowl LII). Nnekay corrects the Today Show, about their Queen Nefertiti facts. Inspired by Justin Timberlake’s Super Bowl performance, James takes us on a magical journey through time exploring a timeline of white folks appropriating Black music, why this has been occurring for over a century, and American music’s roots in African culture. 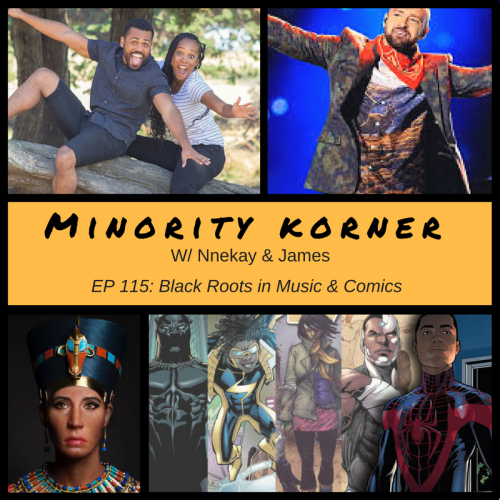 Nnekay continues her discussion from last week exploring Black comic characters you should know! What does it mean to be wished "Have a happy MLK Jr. Day Celebration,"? Who were the leaders of the Asian American Civil Rights movement? Do you think you know EVERYTHING about MLK Jr? Oh really? What was his real name? How YOUNG was he, when he entered into college? Who else from his family was assassinated? Was he Trekkie? Plus we weigh on on the H&M debacle "coolest monkey in the jungle"... oh lord... this mess again. And just how did folks in South Africa respond? All this and more!